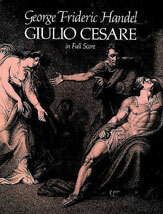 One of Handel's mature works, 'Giulio Cesare' is one of the most popular of his Italian-language operas. Reproduced complete and unabridged from the Deutsche Handelgesellschaft edition. 156 pgs.